There is no doubt trees can cause damage and be damaged in storms. 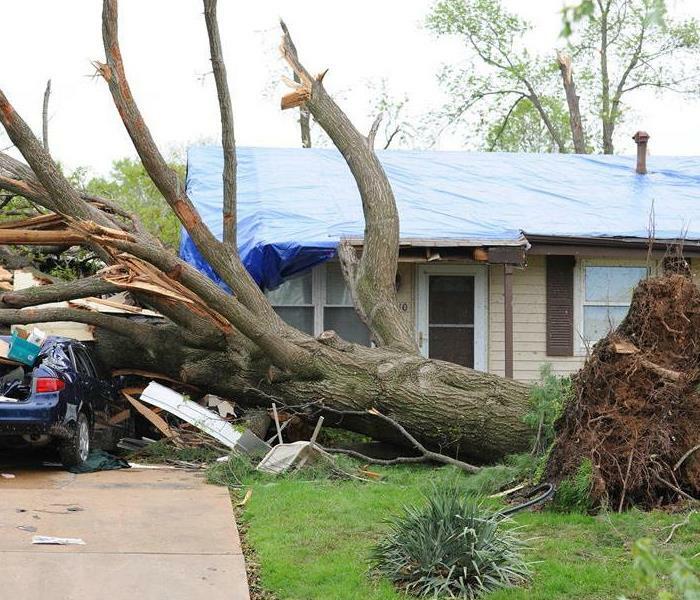 However, appropriately placed and maintained trees can help reduce damage to structures in storms by deflecting wind, and reduce damage to trees. Appropriate actions includes proper placement and planting, and structural pruning prior to the storm. Species selection can also be somewhat helpful in avoiding some damage. 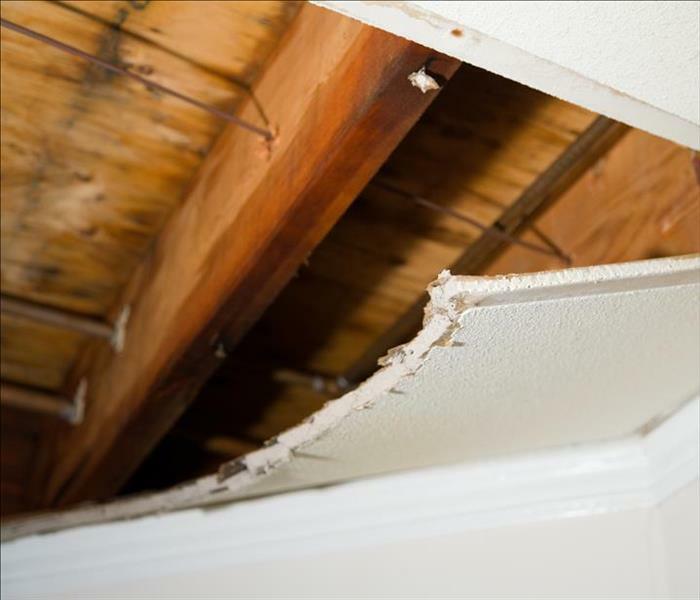 Click the link below for tips on how to protect your home from storm damage. This commercial unit flooded along with 3 of its neighbors. SERVPRO was quick to respond and handled the situation like professionals. We removed all water and all businesses including a hair salon was able to resume business the very next day! 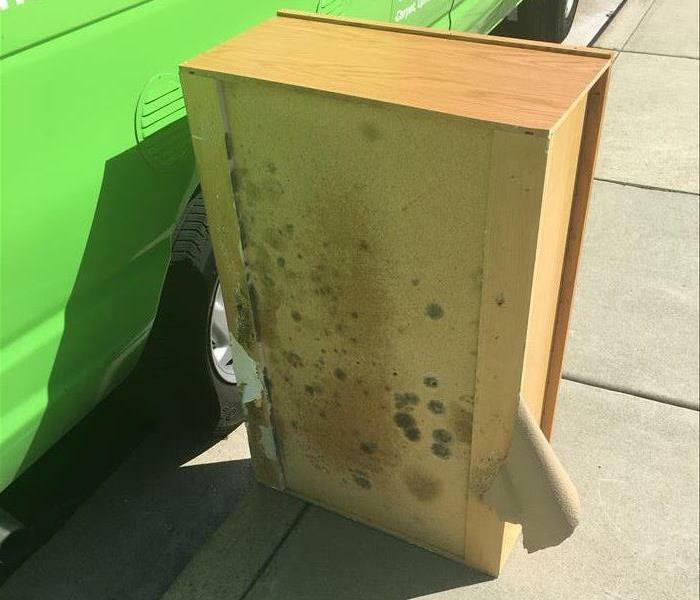 This cabinet was pulled from a kitchen in Danville, CA. There was a pipe leak in the ceiling that was going for a few days and caused a significant amount of damage to the kitchen ceiling. This cabinet was the lone cabinet that needed to be removed due to the mold on the back side. 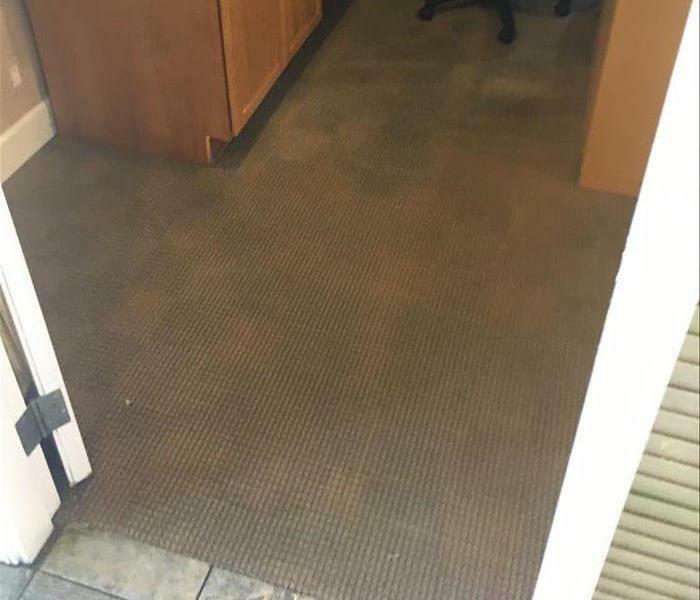 This office in Emeryville, CA fell victim to a water intrusion that came from the double doors. There was enough water to break the weather strip and infiltrate the office. 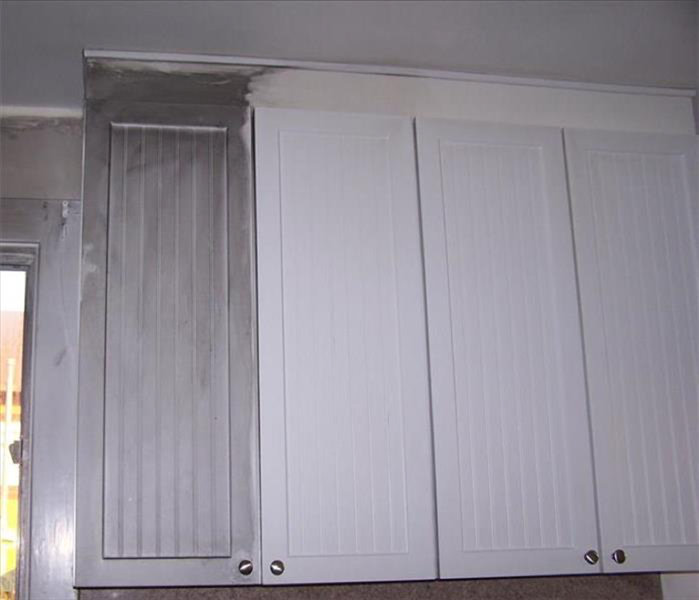 In this photo you can see the result smoke can have on a kitchen even when the fire doesn't physically reach it. Fortunately, this kitchen can be cleaned of any smoke damage. 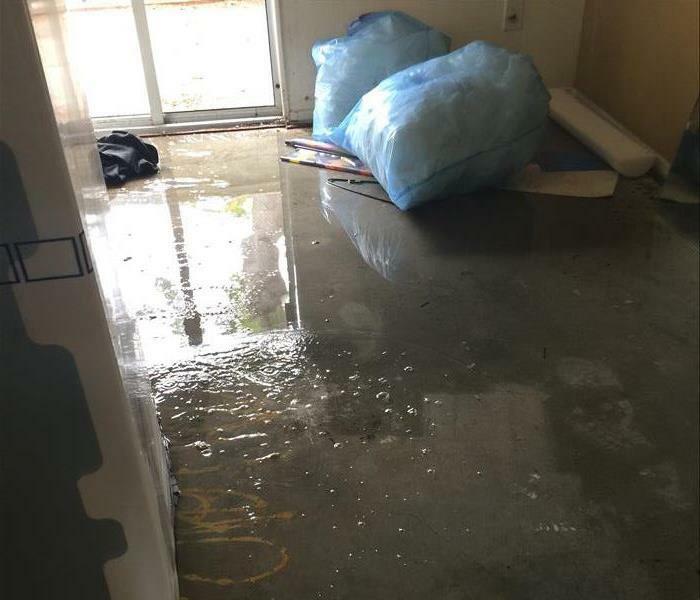 This apartment was flooded due to a toilet overflow from a shared line in an apartment. As you can see in this photo there is substantial amount of water that is leftover after the carpets were removed. In this photo you can see the results from a fire damage that happened in this home. 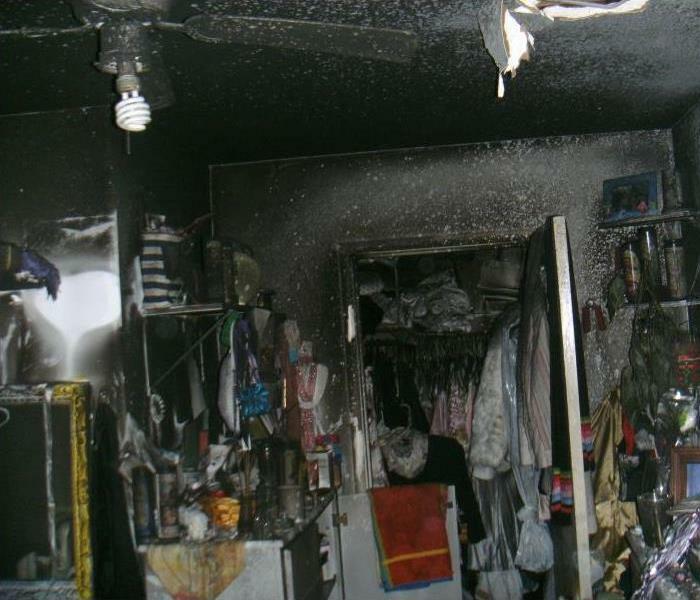 Sometime you are lucky and can save belongings, but sometimes the fire is so extensive there is not much to be salvaged. 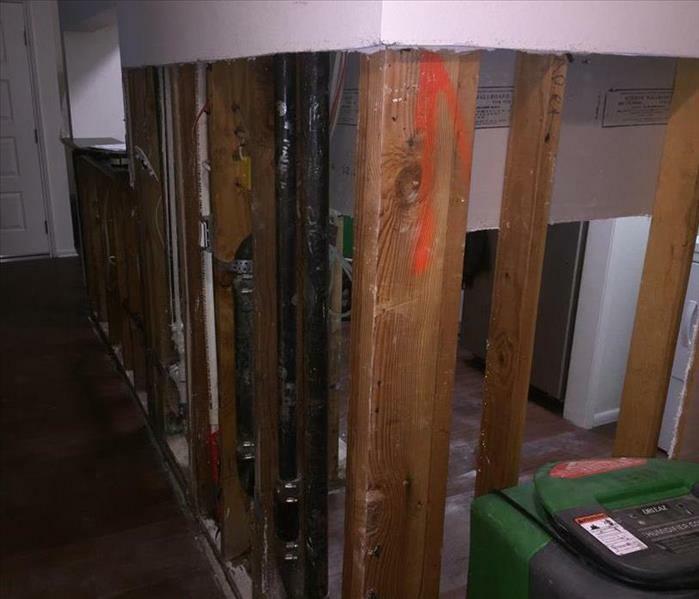 This kitchen and hallway had a significant amount of mould growth, so much that over four feet high of drywall needed to be removed so that we could clean and treat the wood framing! This water damage was due to a clogged toilet had overflown in the downstairs bathroom across the hall. 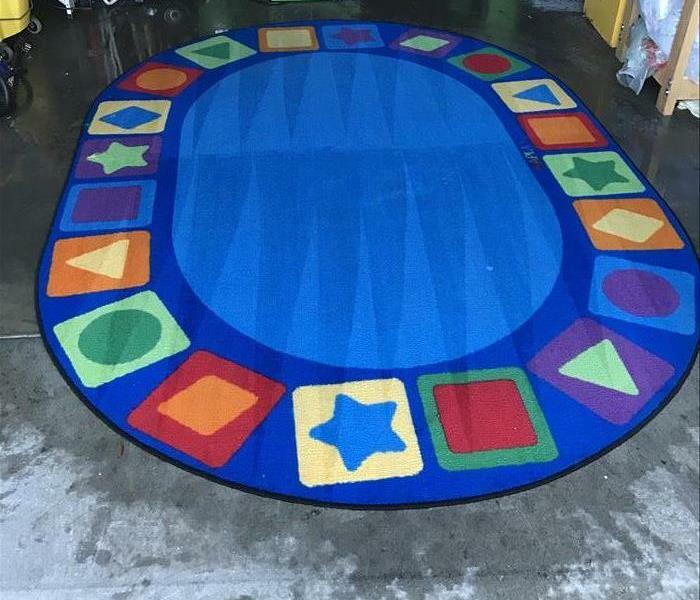 There was a significant amount of standing water on this carpet and pad which needed to be removed and dried. This white cabinet looked fine from the outside but once we removed it from the wall we revealed mold growth on it and the wall behind it. In the photo you can see the black mold along the bottom of the cabinet and the wall. 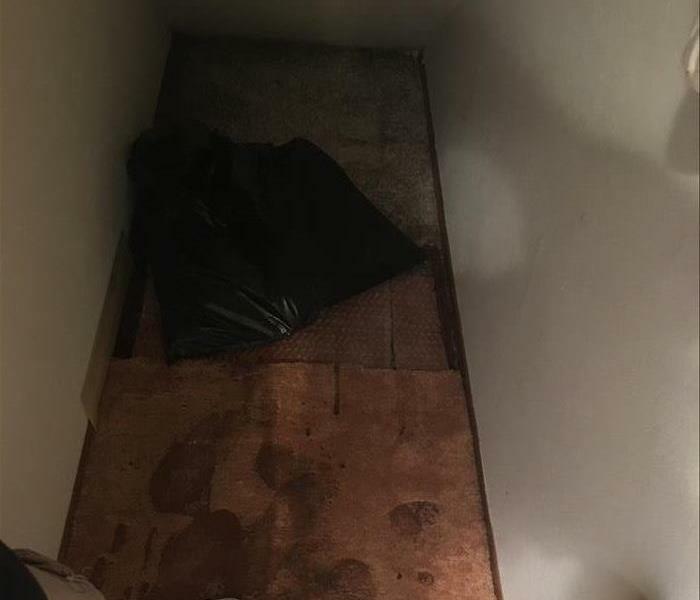 This stairwell may look clean now but prior to the demolition and remediation, it was covered inside and out with black mold. This photo shows the post mold cleanup we performed. Another job well done by our expert technicians. 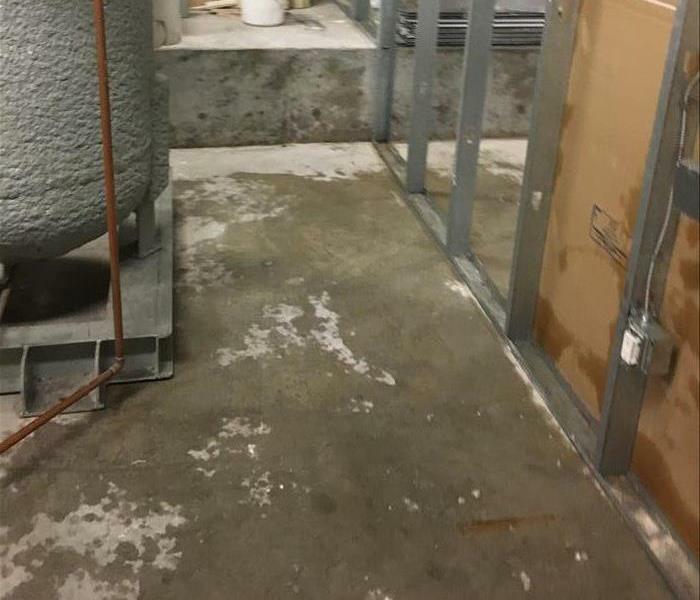 This picture is an after shot of the mold remediation we performed on a boiler/storage room for a large commercial building in Emeryville, CA. The owners had no clue how long it had been going on so we quickly removed and cleaned it for reconstruction. 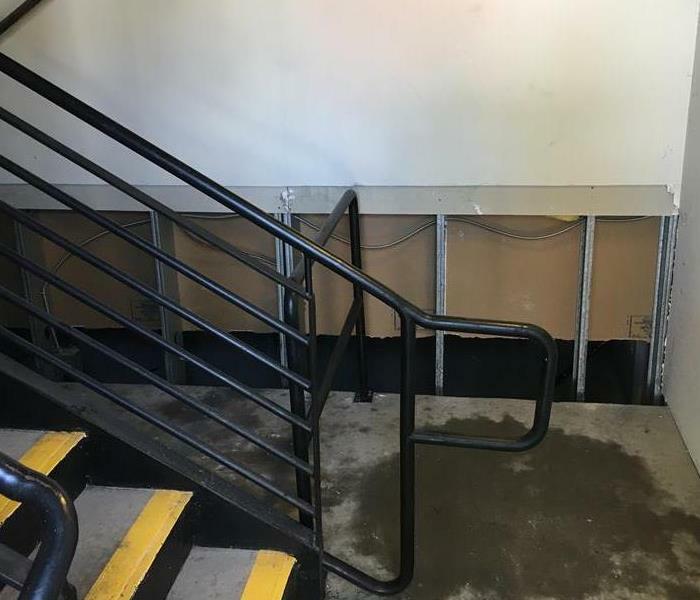 This elementary school suffered water damage due to storms in Northern California. The storage room where they kept equipment for computers and P.E. had standing water that needed to be extracted and dried. 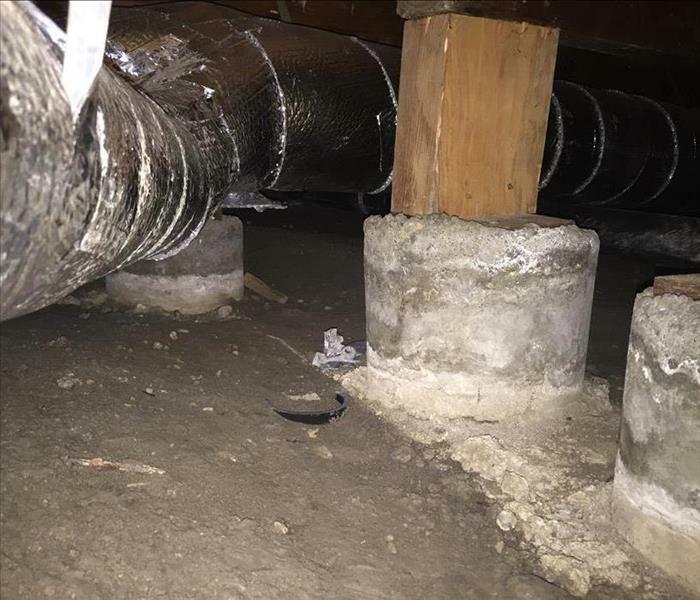 The cause of the damage was a leaky roof that was fixed while SERVPRO of Pleasanton/Dublin was on site. This tube is one of many that are drying the tile floor from the floor below. When we can, we try to dry out tile by getting creative. This is just an example of one of the ways to achieve this goal. This heavily saturated carpet was worth saving so we removed the wet pad to reveal the concrete slab. 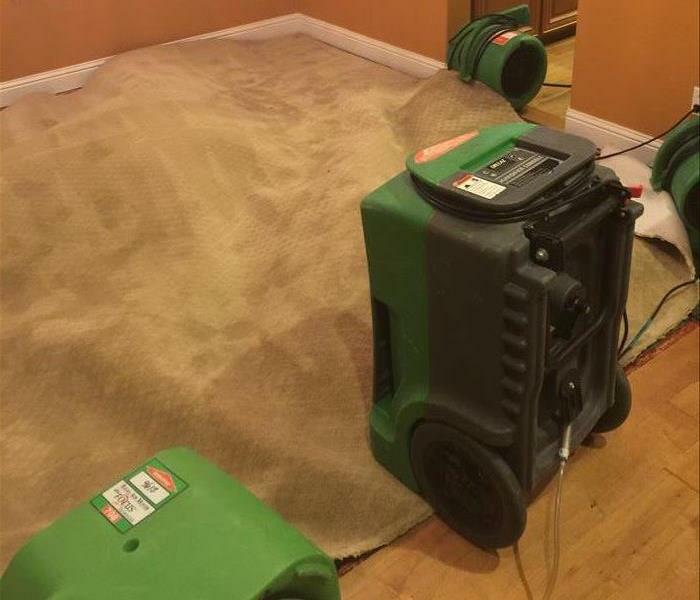 Our air movers and dehumidifiers were placed under the carpet to dry out both in one shot. 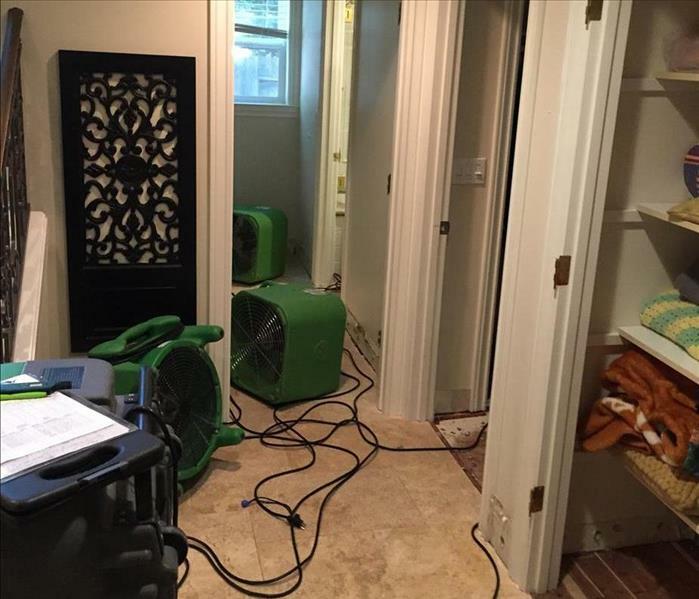 These air movers are drying out the walls that got wet due to a clogged sink that ran overnight. The small amount of carpet that was removed revealed wet sub floor that began to dry. This pool house had water that was standing on the tiles. This photo was before we had gotten in to begin the dry out process. After setting our equipment we removed the baseboard and drilled holes to dry out the wall cavities. Limited damage and a quick turnaround is always the goal. 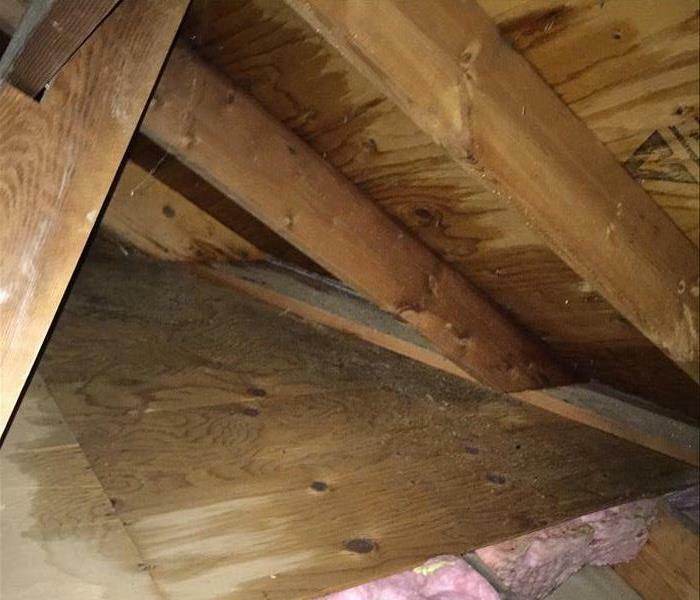 This attic fell victim to heavy storms in Northern California. 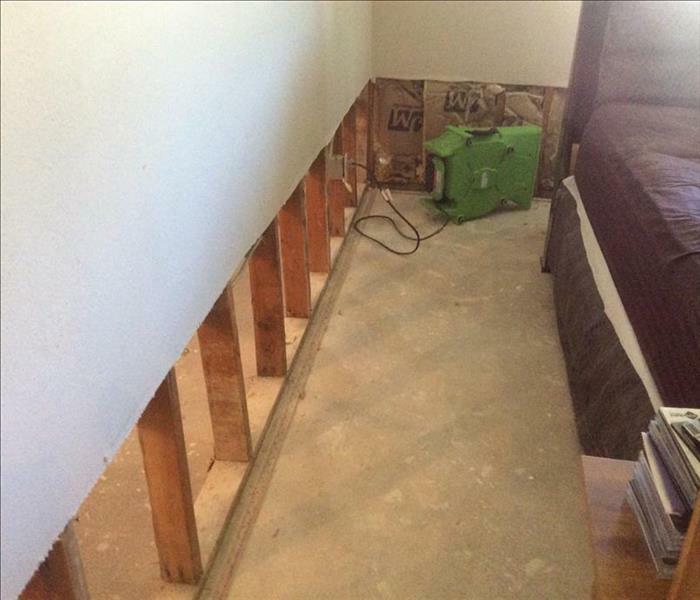 After the insulation was removed we were able to set up dehumidifiers and air movers to begin the dry-out process. Luckily, no lumber needed to be replaced and the attic dried out quickly. This dehumidifier is taking the moisture out of the room because the fire sprinklers were going off and completely saturated the room. Our technicians wanted to prevent mold growth on top of the fire damage. Sometimes the damage from fire is so severe we simply can't save anything. Unfortunately, this does happen but our technicians at SERVPRO of Pleasanton/Dublin are here to help. This is a small sample of what smoke damage can do. While the drywall can be cleaned, the curtain and rod were not salvageable, along with all of these electronics. Our goal is to try to save as much as we can so you don't lose anything. This closet had some mold growing between the sheer wall and drywall. The maintenance noticed water staining and found mold behind the wall which prompted a call to SERVPRO of Pleasanton/Dublin! In this wall cavity there is a good amount of mold growing due to a water leak. Catching it at the early stage is always best but hard to do when it is hiding behind walls! It isn't always in the easiest spot to get to, sometimes you have to get down and dirty and crawl to the location. 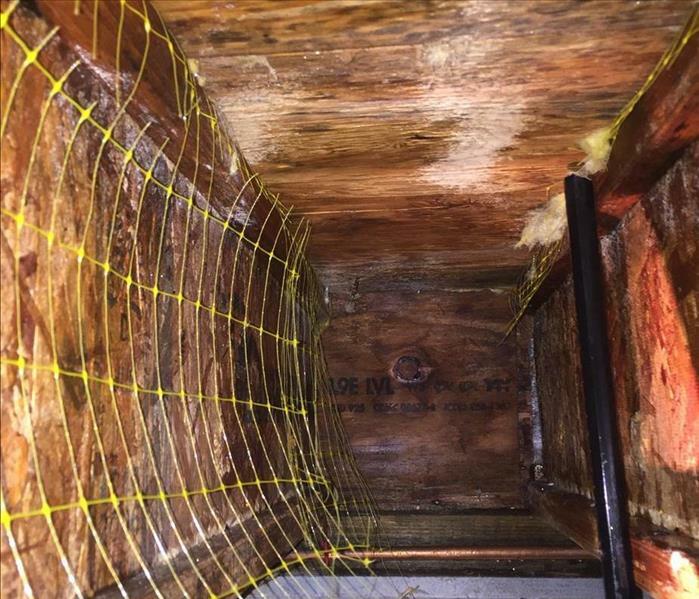 Our technicians are willing to go to the smallest spaces to clean mold, especially under a house. While this is not an everyday occurrence for many, we at SERVPRO of Pleasanton/Dublin have no problem cleaning up after some messy pigeons. 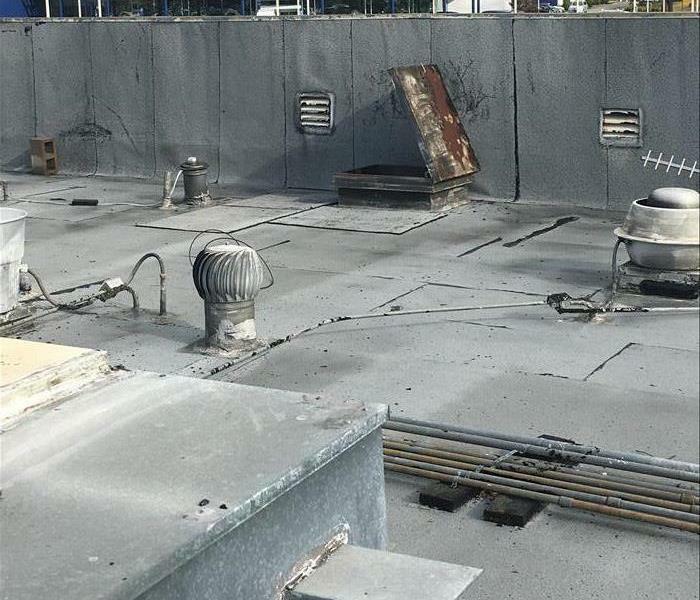 This rooftop fell victim to bird feces but we were able to use our SERVPRO products to make it good as new. 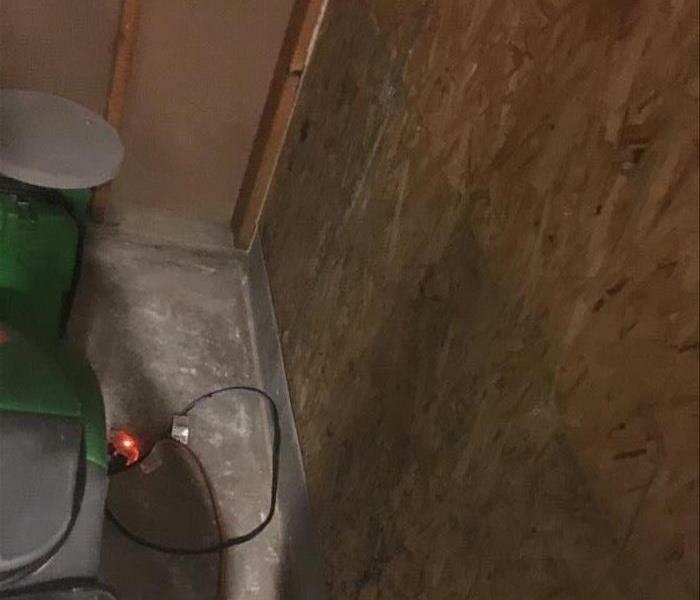 SERVPRO of Pleasanton/Dublin is always ready to extract standing water and restore your facility or home back to normal. 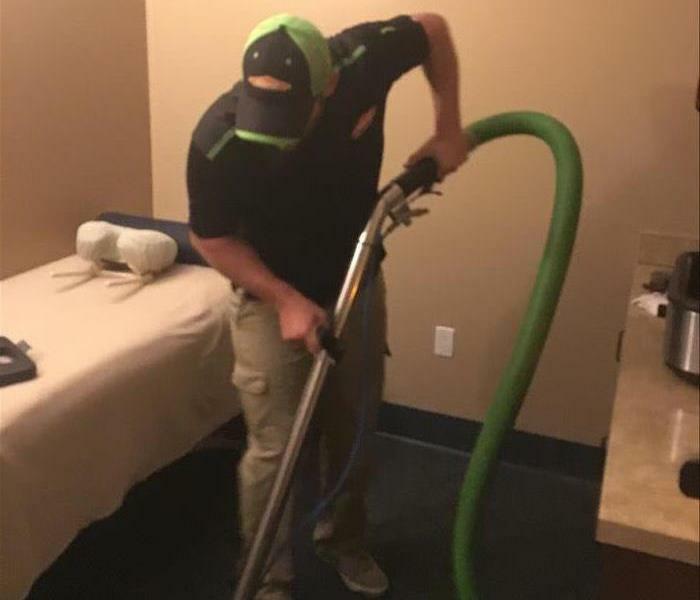 While its not every day you experience a loss you can rest assured SERVPRO will be there with our trained professionals and excellent equipment at the ready. 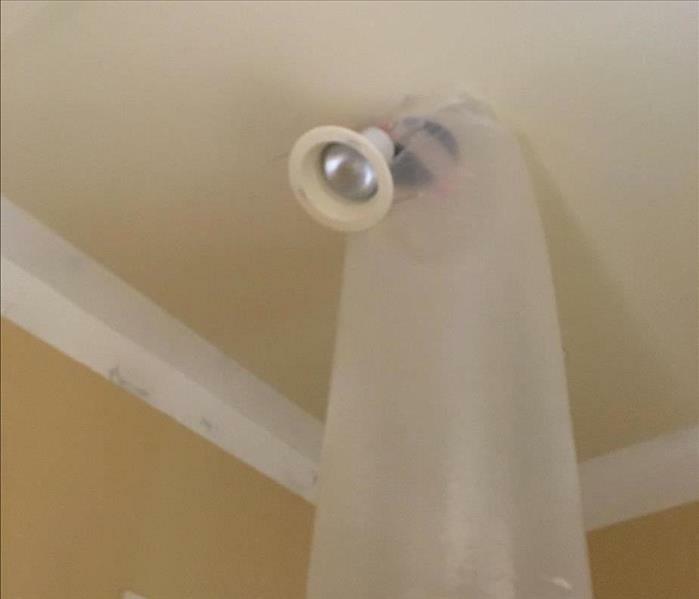 Water damage can happen anywhere. This Job had a calming effect on our crew as they were extracting water and completing the dry out process. It's always stressful for homeowners and business owners when a loss occurs, our job it to make it "Like it never even happened." This bedroom and the adjacent room suffered substantial water damage to the drywall and the framing. 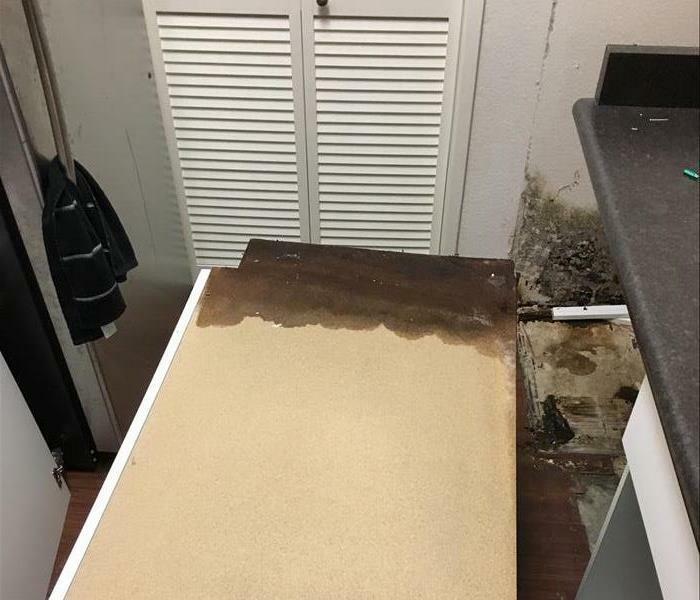 By Speedily extracting the water, and drying out the flooring (the carpets were discarded) and the studs and base plates, water damage was mitigated in this storm damaged Dublin property. 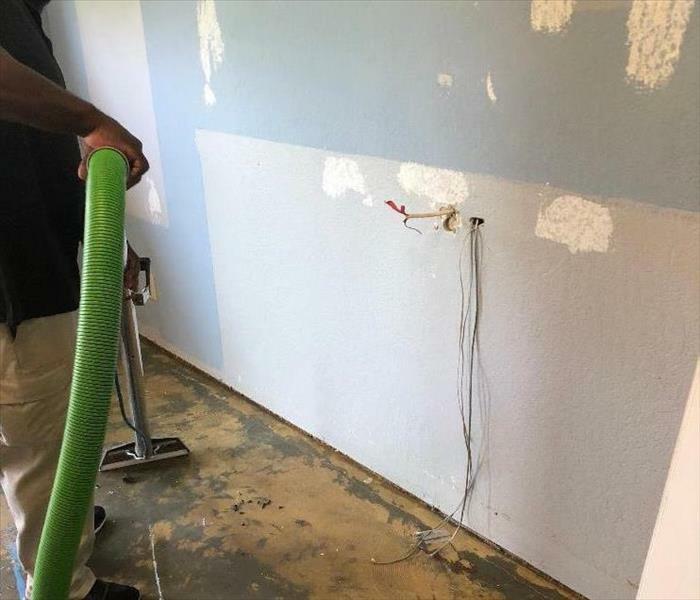 SERVPRO techs make "Like it never even happened." Fire Damage at this Dublin condo left behind some very nasty smoke damage. 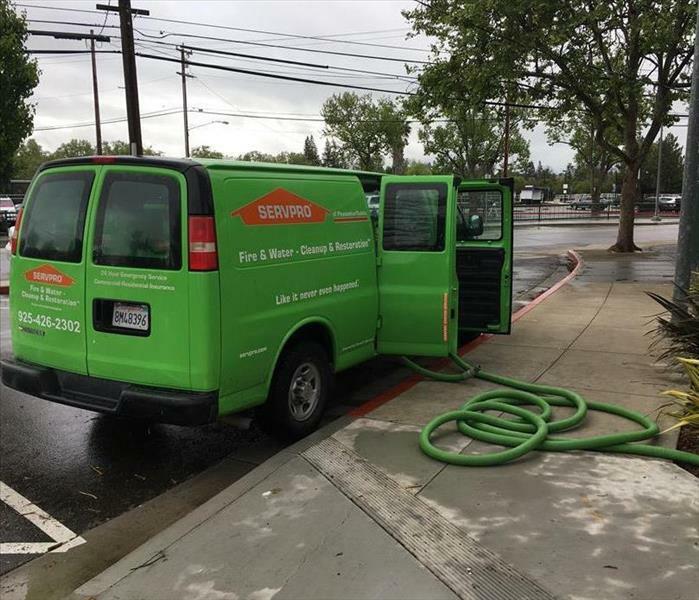 Our crew at SERVPRO of Pleasanton/Dublin has established procedures utilizing specialized cleaning materials to clean up smoke damage. As you can see in the photo above, items that one may consider being un-restorable can be fully restored to pre-loss condition. If you are confronted with the need for a fire restoration company, call SERVPRO of Pleasanton/Dublin. We have the tools, and we have the expertise, and together, that makes SERVPRO magic. We are available 24 hours a day, seven days a week, 365 days a year to better serve you. Call us any time of the day at (925) 426-2302. We are here for you! The flat roof allowed the penetration of rainwater through the beams and sheathing onto the drywall ceiling. 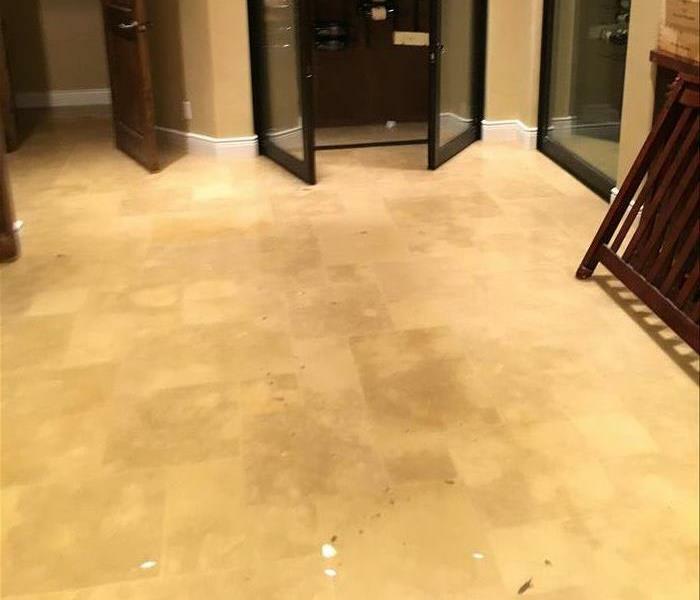 This Pleasanton water damage was completed by replacing the damaged material. Prior to the installation, the wood was treated for odor and anitmicrobial products. The standing Black Water, which is sewage contaminated, pathogen laden water, backed up from a closeby restroom. Wearing safety clothing, gloves, and goggles, the technicians removed the offensive water. 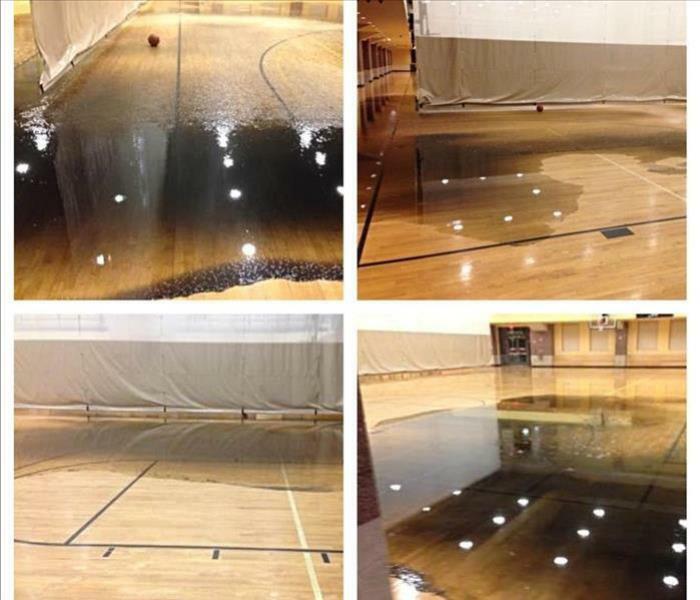 The quick extraction saved the varnished hardwood court flooring from water damage in this Pleasanton gym. 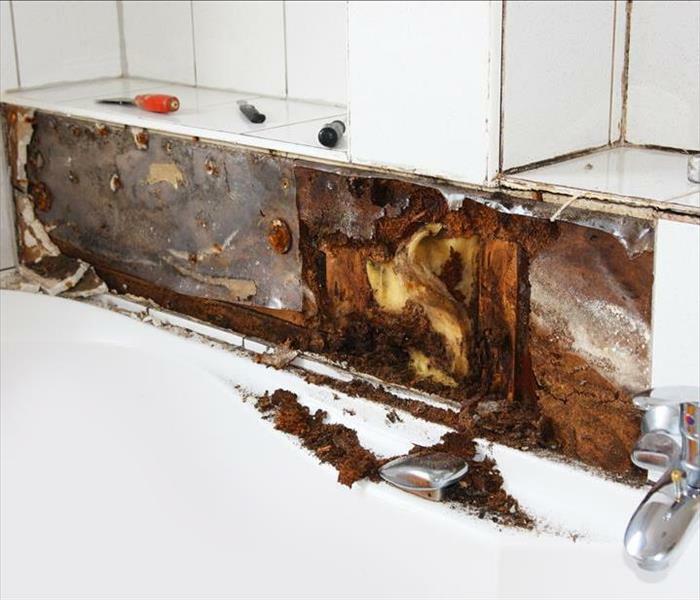 The steady seepage of water finally caused mold damage to this Dublin bathroom. The formica paneling, and the framing was replaced after an anti-fungal agent was sprayed in the affected area. Mold infestations need to be taken very seriously.